Most students guessed and provided no mathematical reasoning to support their answer–revealing a lack of understanding of how to approach the problem. 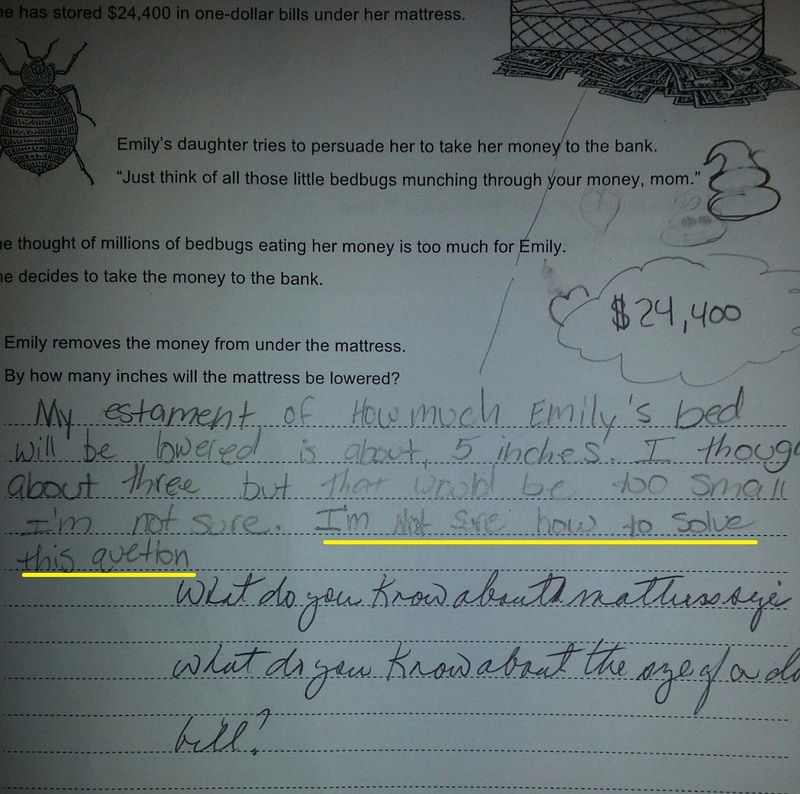 This student has recognized that mattresses come in a variety of sizes, but provides no math to justify her thinking. When I see the students tomorrow, they’ll take that feedback and work independently for about 10 minutes. They’ll then work in their groups to share their progress and come to a solution. One thing I will add is criteria for success. Your work is: a reasonable estimate that is organized and clearly labeled. I love this lesson. I get to see individual thinking. The feedback offers progress while not enabling. Plus, when they collaborate every student should be able to contribute to the solution. I’m impressed by your patience. I think that this is a great problem, but I’d be hard pressed to say ‘I love this lesson’ at the end after reading multiple copies of the kind of work you have shown here. I wish I knew the answer to the bigger question at hand – How do we teach resourcefulness and perseverance in the face of novel problems? Thanks for writing about this and sharing both your students’ work and your feedback to them. I understand where you are coming from. It’s a conundrum. If students are not exposed to non-routine problems they will never know how to approach them. I also need to provide exemplars of what organized work looks like. I wish I knew the answer to your question about teaching resourcefulness in the face of novel problems! I do so enjoy blog posts that include photos of student work. I also love how much writing your student’s are doing. It seems like, from the writings, that the students are being pushed to a good level. They have a lot to say, but you can read the words and see that they have a bit to learn. So, way to go there. This is an example of a good model. The answer isn’t a chance for us to cast judgement upon the students. It is a chance to start (or continue) a conversation. The conversation begins with a learning task. Hopefully it ends with increased learning. “This is an example of a good model. The answer isn’t a chance for us to cast judgement upon the students.” You are so right! My intent was to have them explore and gain access to the problem. They need more feedback and practice before I even consider judging them with a grade. Thanks for your comment! 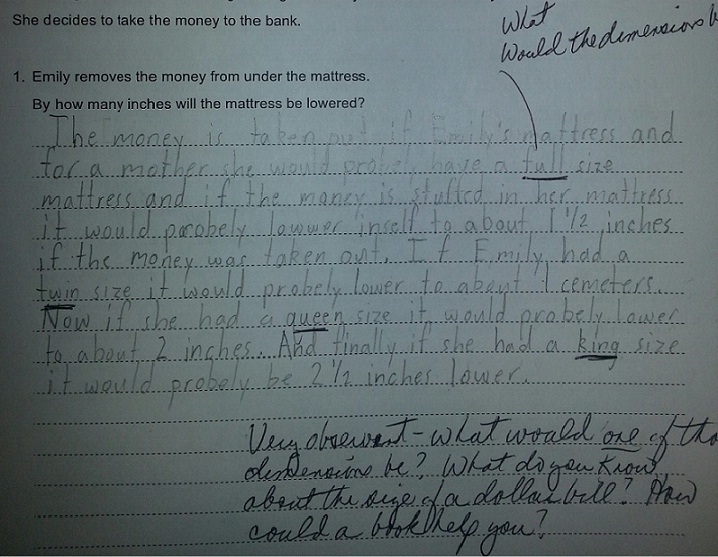 Interesting that the student thinks the stack of bills would be higher the bigger the mattress. It might be worth exploring the relationship between area and volume. I just may do that! I presented the task “out of context”, meaning geometry is not our current unit of study. I like the idea of every once in a while tackling a task that’s outside the unit. Not every problem we encounter is a neat package! Thanks, Steve, for checking in. I want to try this problem before we begin our unit on area to gauge their understanding. I am curious how day 2 went. Were students able to make accurate estimates for the size of a mattress on their own or did you need to do more scaffolding? A few students needed more scaffolding…How tall are you? Do your feet hang over the end of the bed? How much headroom do you think you have? etc. Most were able to estimate the dimensions, but several groups mixed units of measure–finding the surface area of the mattress in square feet, vs finding the area of the dollar bill in square inches. I wrote about day two here. Instead of collecting individual student work, you could create resource cards with questions posed and hand them out as groups need them. There are advantages and disadvantages to both. This task really made the students think! I gave this problem to my 7th grade Algebra I class a couple of weeks ago. I had the kids work in pairs, and I designated myself the class researcher. One member of the team could approach me with a “relevant and precisely stated” question and I would look up the answer on the web, write it on a slip of paper, and deliver it to that particular pair of students. They had some great discussions about what to ask me… and I thought it was beneficial this early in the year for them to spend time deciding what was a relevant and well-formulated question. I also liked the worksheets that MAP provides to go along with this, which have the students look at the solutions generated by kids from another school. We had some good discussion of what assumptions these other kids had made, and whether or not they were appropriate assumptions. All of my kids thought their own work was much better than the samples from other schools!